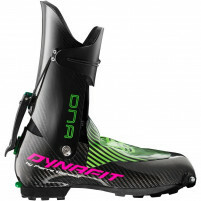 Dynafit is turning skimo race bindings inside out. Literally. Instead of a binding clamping onto your boot, with the P49 system your boot expands to click into a solid block of metal. It’s a revolutionary new tech-system designed to be the fastest race binding possible. P49 is short hand for “Project 49”, and at 49g per side the binding weighs less than half that of traditional race bindings. 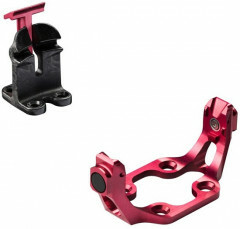 Simple operation, improved system-stiffness, and full ISMF compatibility are all included. Can I go up and down hill? Of course! Depending on the orientation of a threaded lever on the side of the toe, the toe piece can function as locked or fully releasable. In either mode, you just step into the system and skin away. Just as in auto-locking bindings of the past, there is no need to flip a toe-lever. It’s the ultimate in simplicity and speed. Just use the hands-free step in, skin away, rip skins, ski down, and repeat. The heel piece is comprised of a carbon fiber tower with a notch that locks the heel tab of the boot down like a vise. When you step down, the heel tab of the boot flexes the tower towards the tail of the ski until it clicks into the notch. From that point on the bindings are ready-to-rock with very little flex in the system, but still allowing full lateral and vertical release. To skin up, flip an ingenious pedestal into place that prevents your boot from locking in. To exit the binding, press the button on the side of the toe piece. Quite simply, the Dynafit P49 binding is the fastest way up, down, and onto the podium. Light, simple, and clean with almost no moving parts. Full vertical and lateral release, which can be disabled. Light binding platform with impressive system stiffness. Touts a hands-free step in for lightning-fast transitions. The entire binding weighs less than ½ of most other bindings. Binding is only compatible with the Pintec boot. any idea on release values? Hi Steve, we have not been able to test the binding to get an idea of release value, yet.